The Madison Academy Lady Knights varsity volleyball team lost to Pleasant View Christian 0-3. This drops the team record to 1-1 for the regular season. The next game is a home game against Franklin Classical on Tuesday night, August 18 at 5:30pm. The JV game starts at 4:30pm. Madison Academy is adding golf as a sport to its interscholastic sports program. The season will play out in the fall and spring. Coach Perkins from Madison Campus Elementary is leading out with this team. Tryouts are Wednesday, August 19th at 4:30pm at the Riverside Golf Course. In other Madison Academy sports news the cross country team is forming and has began to practice. There is a parent meeting for Golf, Cross Country and Fall Soccer on Monday, August 17 in the library at 6pm. Coaches will provide information about the sports and their seasons and paperwork for parents to sign if their child is interested. The soccer team is scheduling a few games in the fall so that the team can experience tournament play. They will go to the National Association of Christian Athletes [NACA] Volleyball & Soccer Tournament held each year in Dayton, TN. The girls volleyball team will participate as well. This year’s tournament is scheduled to be played October 28-30, 2015. Madison Academy girls volleyball team wins its first match against McClain Christian. The Lady Knights take on McClain Christian Academy in the first away game of the season starting at 4:30pm. For a schedule of games go to our sports calendar or download it there to your computer, tablet or phone. Previously at the beginning of the month during the Play Days our both varsity and jv played at or above .500. Thursday is a home game at with MA playing Pleasant View Christian starting at 5:30pm. See the schedules and results of the games here and on MaxPrep or MA/MCE Athletics. 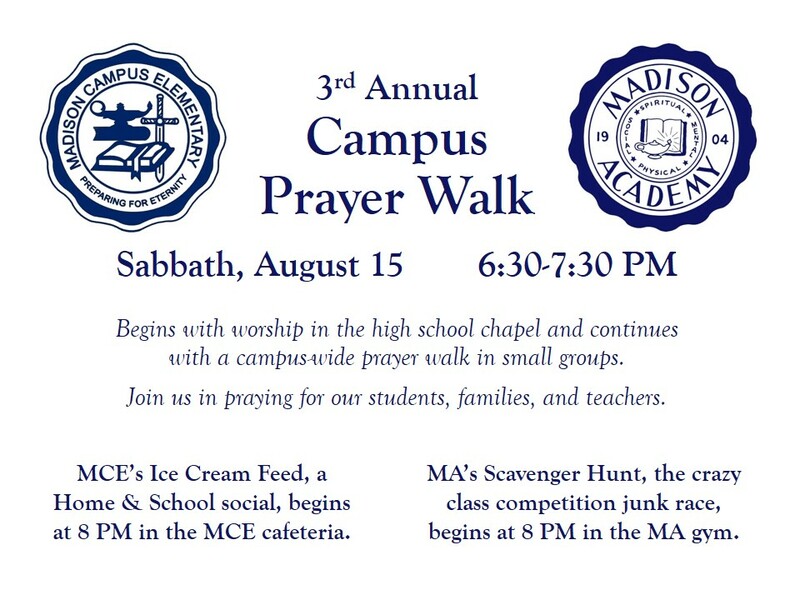 Sabbath, August 15 at 6:30-7:30 PM is our 3rd annual Campus Prayer Walk, which begins with worship in the chapel and continues all over the school grounds. Sunday, August 16 begins our SA Fall Picnic at Indian Creek Camp. We leave the school at 3:30 PM and return on Monday by 5:30 PM. This overnight, action-packed excursion continues to be a student favorite! Click here for a permission slip.